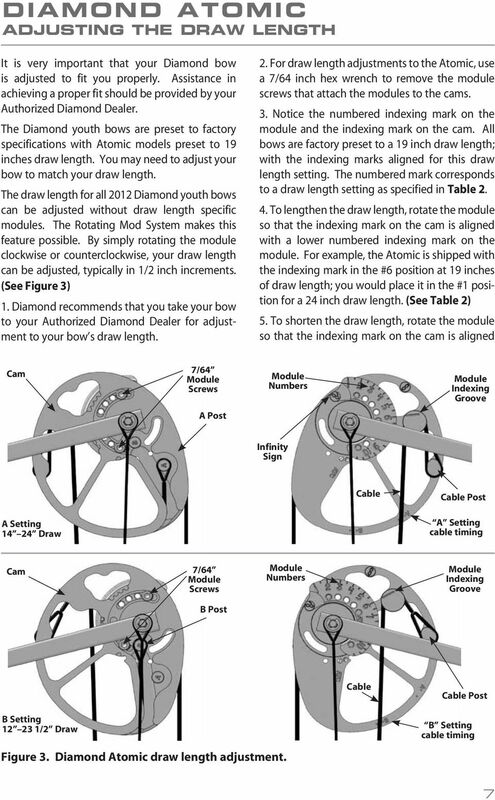 Download "Youth bow owner s manual"
6 setting THE draw weight Draw weight on the Diamond Infinite Edge is adjustable from 70 pounds downward to 5 pounds. 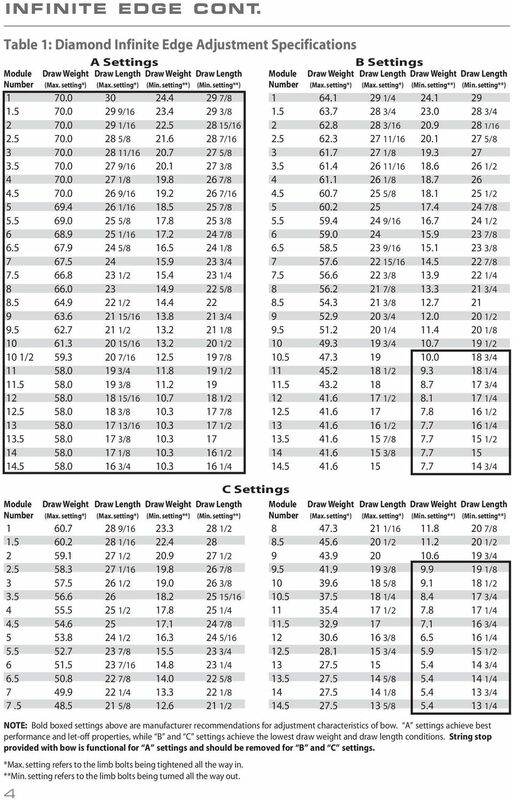 Table 1 reflects the available draw weight settings for the A, B, and C string post settings. 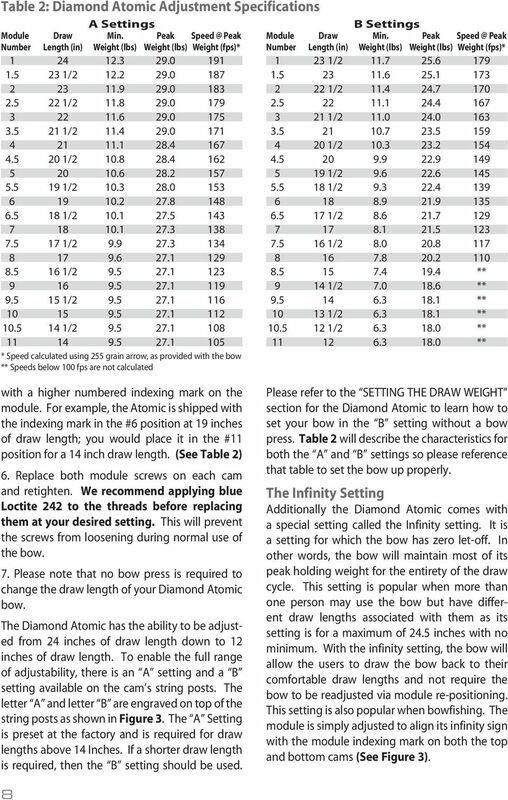 Please reference this table when setting up your bow. Draw weight can be adjusted by using a 3/16 inch hex wrench to either tighten or loosen the limb bolt. The draw weight should be adjusted equally on top and bottom limb bolt. 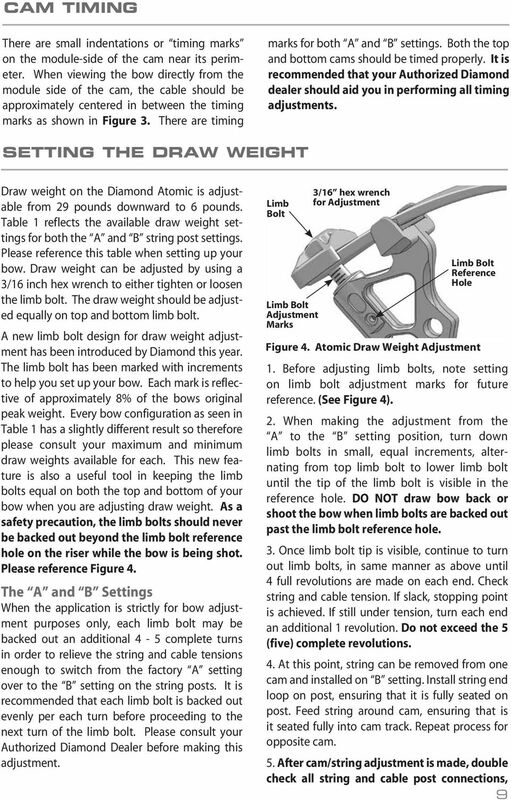 A new limb bolt design for draw weight adjustment has been introduced by Diamond this year. 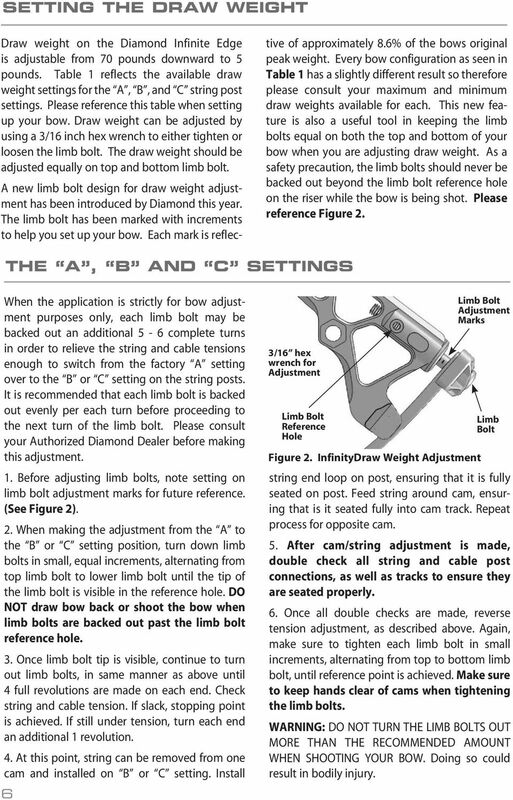 The limb bolt has been marked with increments to help you set up your bow. 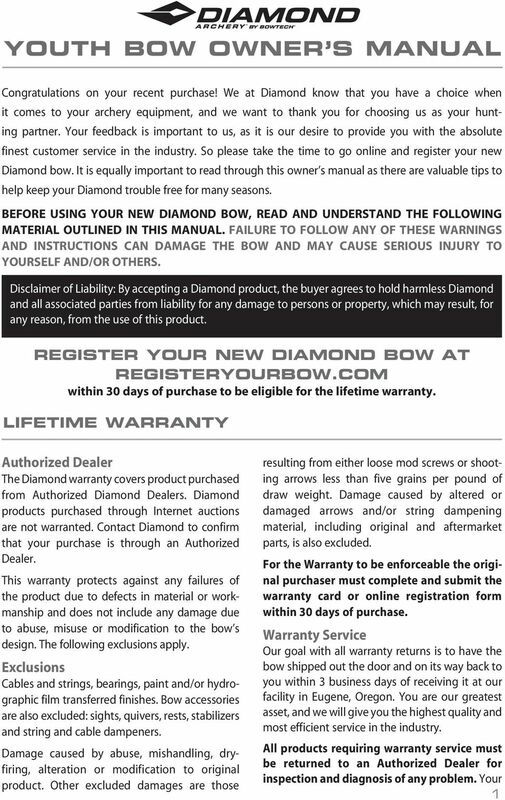 Each mark is reflective of approximately 8.6% of the bows original peak weight. 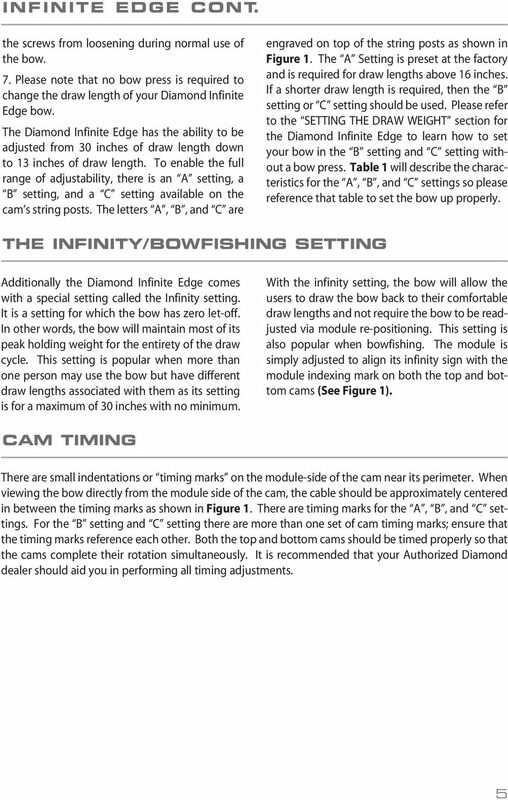 Every bow configuration as seen in Table 1 has a slightly different result so therefore please consult your maximum and minimum draw weights available for each. This new feature is also a useful tool in keeping the limb bolts equal on both the top and bottom of your bow when you are adjusting draw weight. 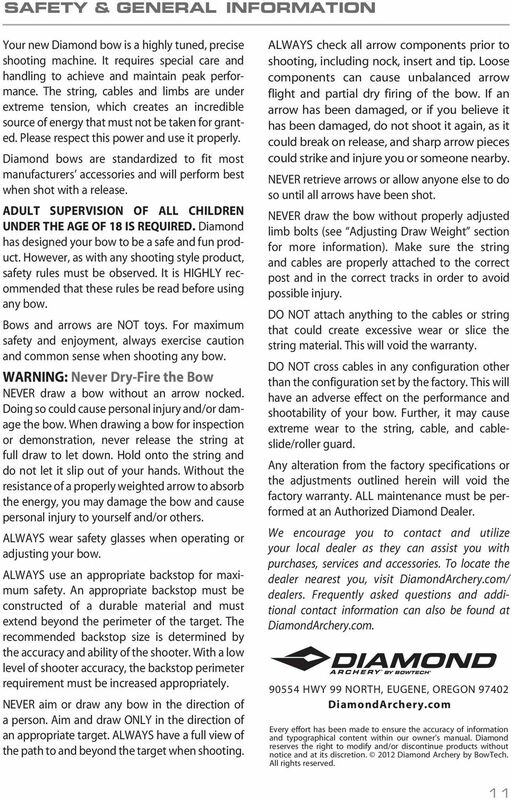 As a safety precaution, the limb bolts should never be backed out beyond the limb bolt reference hole on the riser while the bow is being shot. Please reference Figure 2. 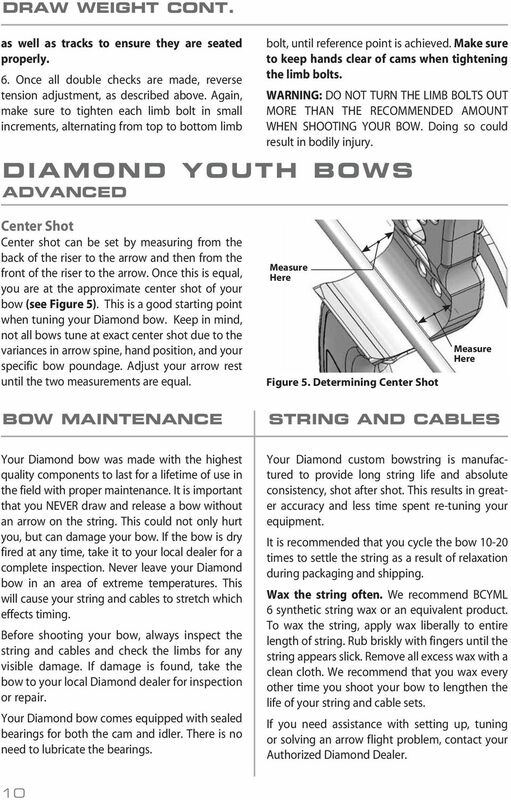 The A, B and C settings When the application is strictly for bow adjustment purposes only, each limb bolt may be backed out an additional 5-6 complete turns in order to relieve the string and cable tensions enough to switch from the factory A setting over to the B or C setting on the string posts. It is recommended that each limb bolt is backed out evenly per each turn before proceeding to the next turn of the limb bolt. 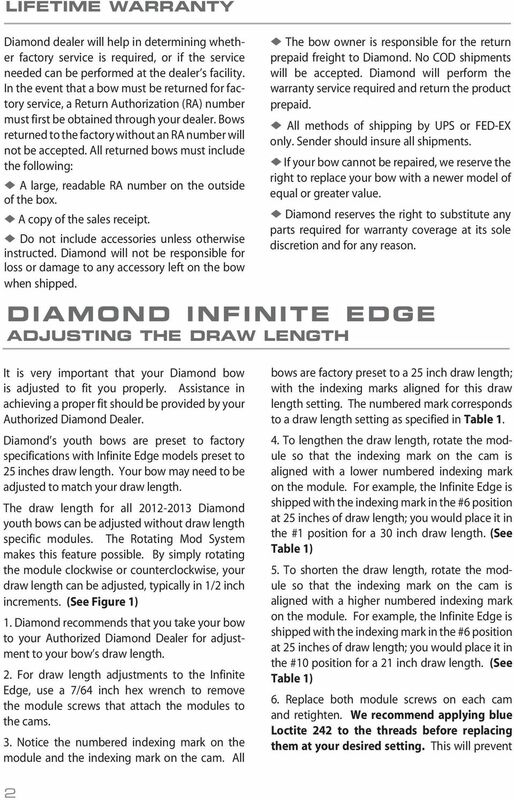 Please consult your Authorized Diamond Dealer before making this adjustment. 1. 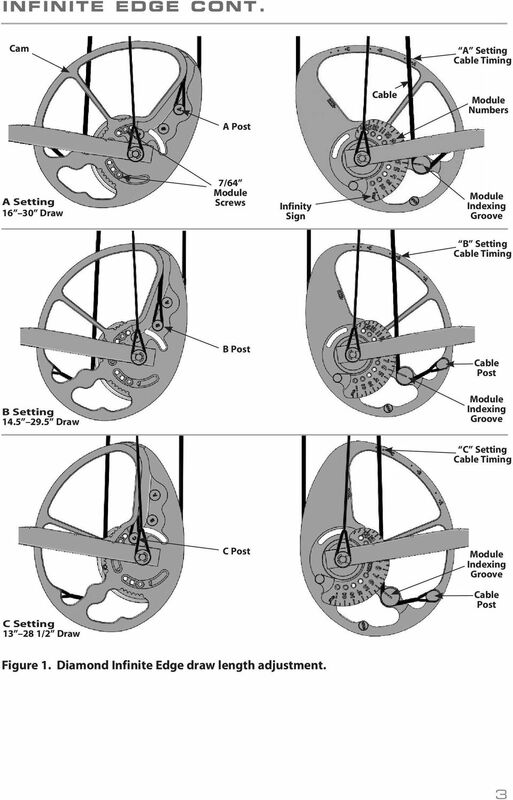 Before adjusting limb bolts, note setting on limb bolt adjustment marks for future reference. (See Figure 2). 2. When making the adjustment from the A to the B or C setting position, turn down limb bolts in small, equal increments, alternating from top limb bolt to lower limb bolt until the tip of the limb bolt is visible in the reference hole. 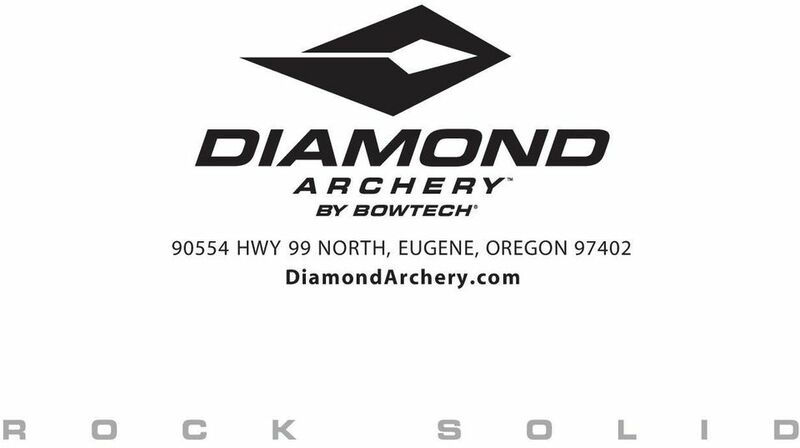 DO NOT draw bow back or shoot the bow when limb bolts are backed out past the limb bolt reference hole. 3. Once limb bolt tip is visible, continue to turn out limb bolts, in same manner as above until 4 full revolutions are made on each end. Check string and cable tension. If slack, stopping point is achieved. If still under tension, turn each end an additional 1 revolution. 4. At this point, string can be removed from one cam and installed on B or C setting. Install 6 3/16 hex wrench for Adjustment Limb Bolt Reference Hole Limb Bolt Adjustment Marks Limb Bolt Figure 2. InfinityDraw Weight Adjustment string end loop on post, ensuring that it is fully seated on post. Feed string around cam, ensuring that is it seated fully into cam track. Repeat process for opposite cam. 5. After cam/string adjustment is made, double check all string and cable post connections, as well as tracks to ensure they are seated properly. 6. Once all double checks are made, reverse tension adjustment, as described above. Again, make sure to tighten each limb bolt in small increments, alternating from top to bottom limb bolt, until reference point is achieved. Make sure to keep hands clear of cams when tightening the limb bolts. WARNING: DO NOT TURN THE LIMB BOLTS OUT MORE THAN THE RECOMMENDED AMOUNT WHEN SHOOTING YOUR BOW. Doing so could result in bodily injury. INTRODUCTION. Please read this manual carefully for a through explanation of the Decimator ProRackG and its functions. 08.09 product manual H-4210A PORTABLE STATIC CONE PENETROMETER PORTABLE STATIC CONE PENETROMETER GENERAL INFORMATION The H-4210A Static Cone Penetrometer is an unparalleled device for measuring soil consistency. Instructions and User Guide. Select Series: Vascular Access Ultrasound Training Models BPO100, BPBV110, BPP120, BPNB150. June 8, 2011 Rev 2. 1. SAFETY RULES. 8. Avoid placing objects in the path of the blades. notebook security DEFCON CL cable lock USER GUIDE Visit our Website at www.targus.com Features and specifications subject to change without notice. 2006 Targus Group International, Inc. and Targus, Inc.
1. SAFETY RULES WARNING TO REDUCE THE RISK OF FIRE, ELECTRIC SHOCK OR PERSONAL INJURY, MOUNT FAN TO OUTLET BOX MARKED "ACCEPTABLE FOR FAN SUPPORT".